Overview - Probably only the people on the trip will wish to read the full write up on this so here is a synopsis. 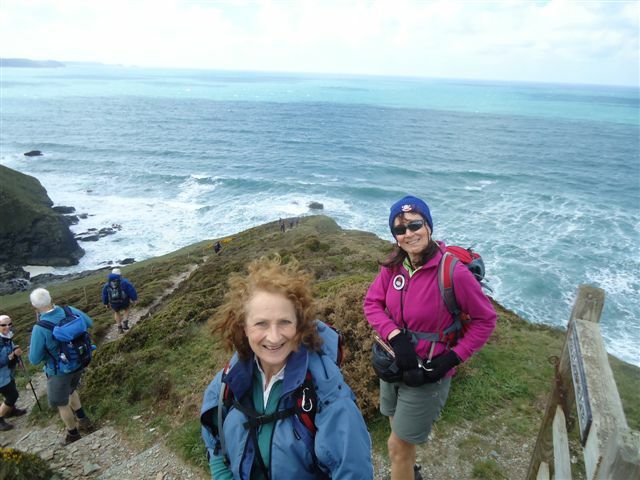 We walked 70 miles, Bude to Newquay, of the South West Coastal Path over four days with a day off in the middle. 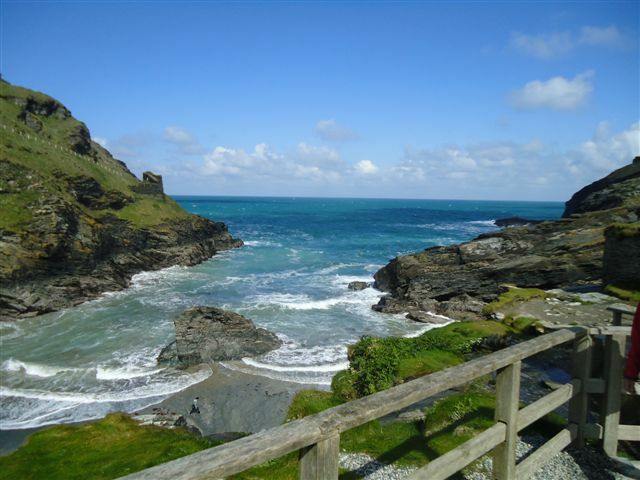 We stayed in Newquay and organised the whole trip with Alfatravel, our second walking holiday with this company. The base, hotel, coach, organisation and staff were superb, the food and accommodation more than adequate. 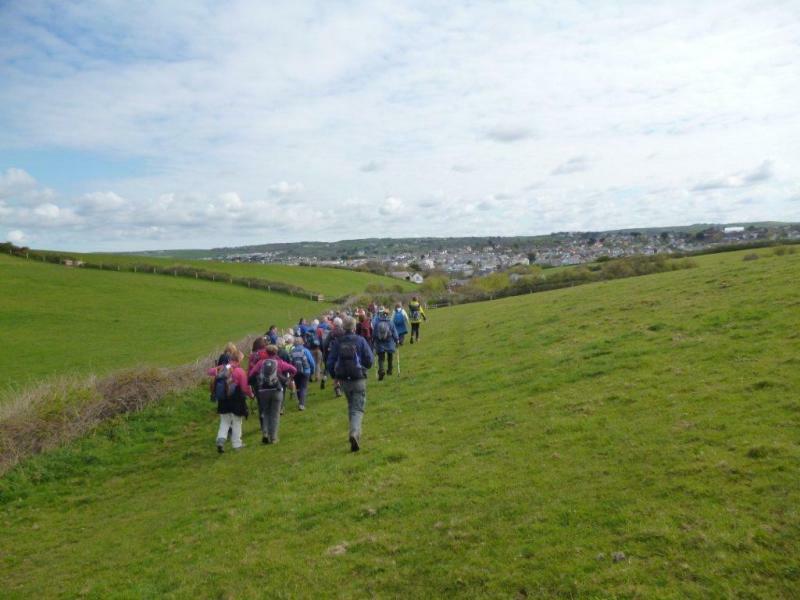 The walk itself was stunning with breathtaking views, well-maintained footpaths and easy to follow way-marking. Each day was tough and having a day off in the middle was a masterstroke. 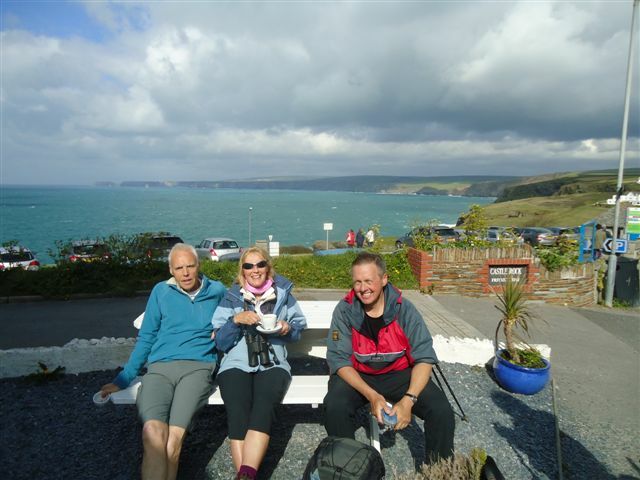 We used the Cicerone South West Coastal Path guide and it was ideal for our purpose. The weather was incredibly kind. The one really bad day proved to be the Wednesday, our day off, but the rest of the time was sunny but windy and it was amazingly Friday afternoon before we saw real rain. Walking with a party of forty five people did not prove to be a problem although we were well spread out for much of the time. Given the wisdom of hindsight we would tighten that up and walk more as a regimented group. All in all a superb experience and a better bunch of people never left these shores! The quite amazing and efficient Alfa Travel transport feeder service picked everyone up from all round the North West and by ten o’clock we were all at Burtonwood Services near Warrington on our coach with our luggage stored away in the hold. Rosie and John, Ken and Jacqui being “southerners” were meeting us at the hotel. The journey, with one motorway services stop and one at the delightful Daphne Du Maurier’s Jamaica Inn, was over before we knew it. The disappointment on the day was that despite pre holiday assurances to the contrary we had not been allocated our “pet” driver from last year Derek but had instead had Andy. To rub salt in the wound Derek was driving the Alfa sister coach to the very same location and hotel, the Eliot, to which we were bound. By six o’clock we were all checked and booked in at this establishment and we had met the “Ayatollah” on the front desk wearing the name badge of “June”. This lovely lady soon had from us the one thing she needed to make her week go swimmingly, the name of the organiser, “MISTER BULLEN” (a week later I am still having nightmares). After Barbara had made us march to the nearest Weatherspoon’s we had a fairly early night in readiness for the hard day ahead of us. The hotel had kindly arranged a 7.40am breakfast for us so we could be loaded up and on our way by eight thirty. 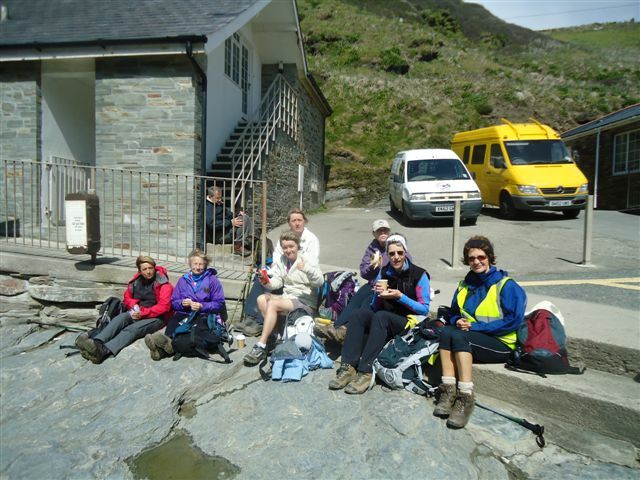 They had also agreed to do us packed lunches for each of the walking days and what a success, if not a gourmet delight, they proved to be. For some reason our party had been spread all over the restaurant rather than sitting together and the Ayatollah told us that was the way it would stay. So with our rucksacks and boots on board we left the hotel with the words “MISTER BULLEN” ringing in my ears if not everyone else’s! Now came the worst part of the whole week – the driver’s running commentary. It was one hour thirty minutes drive to Bude but it seemed like a fortnight! After just twenty minutes of his very loud reminiscences I was contemplating jumping from the emergency door – only to find there was a queue in front of me! I would even have kissed the Ayatollah to have him replaced! At one point he said, “I’ll have to be quiet for a minute now” and the whole coach spontaneously cheered – rapturously – but still he didn’t get the message. What a relief it was to get walking that day! Derek, the driver we had wanted, had come up trumps again and took our non walkers Betty and “Our Lass”, Lynn, off on his coach excursion for the day to the Eden Project. 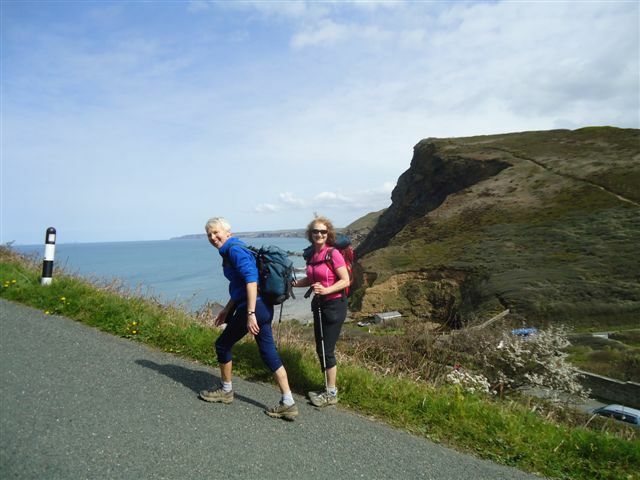 Day One - Bude to Boscastle 16.5 miles. 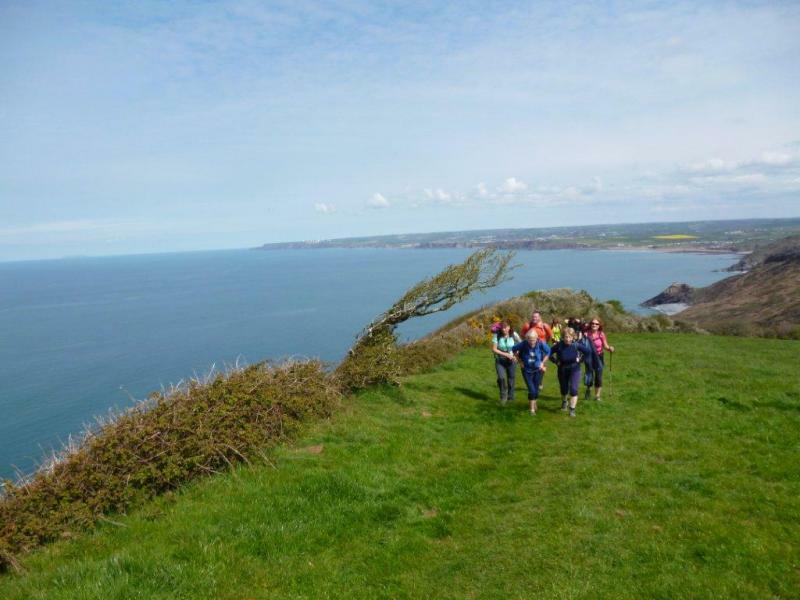 Starting just south of Bude, we headed onto the coastal path and followed the gently rolling grassy path to Upton, passing the Phillips Point nature reserve. The grassy path changed to gorse, which was in full flower giving many opportunities for `prize winning` photographs. 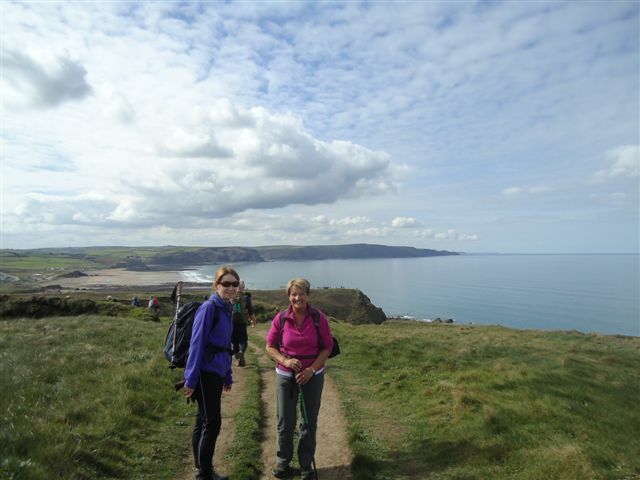 The path then descended to Widemouth Bay and along the beach, before climbing back onto the cliff top path. 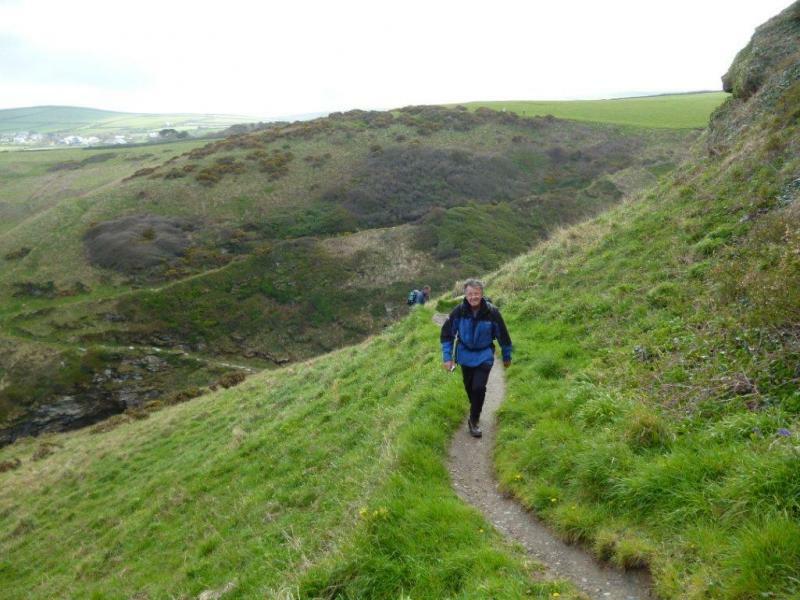 A number of sharp ascents and descents brought us to Crackington Haven, where the rock strata in the cliff had been twisted into many strange shapes. 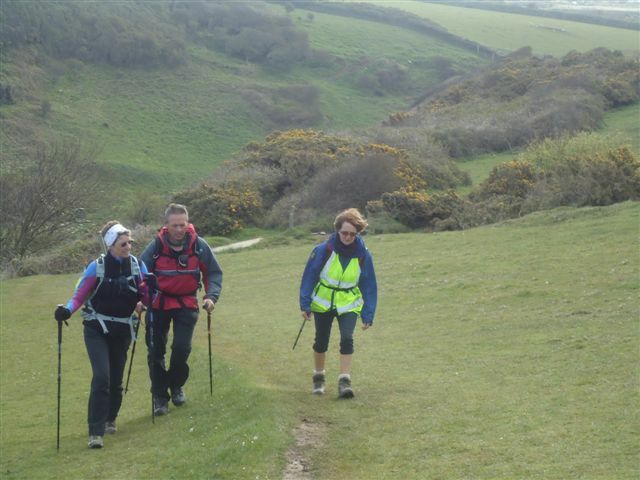 Luckily, Helen, a retired geography teacher, was on hand to tell us they were known as `recumbent folds ` More tough walking followed before lunch was taken. 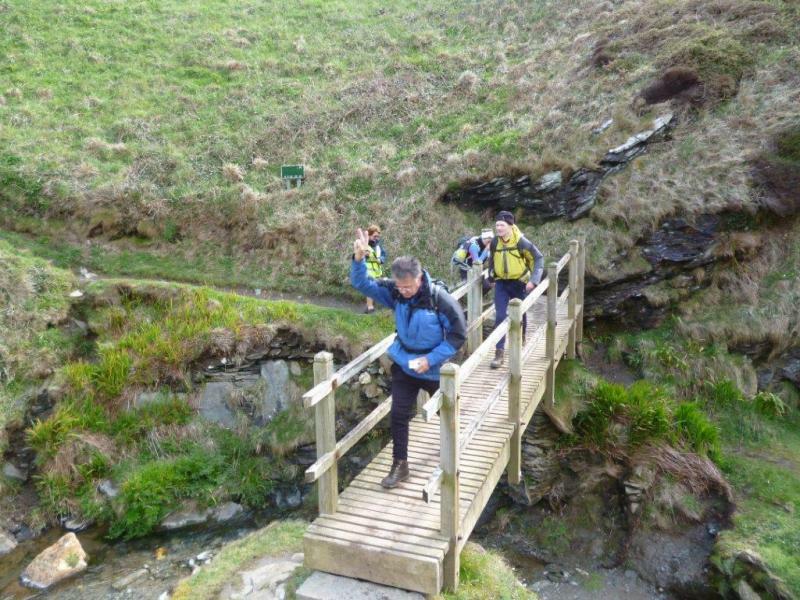 Suitably refreshed, we completed the final section to Boscastle, a pretty village and small harbour, which was devastated by floods in 2004. 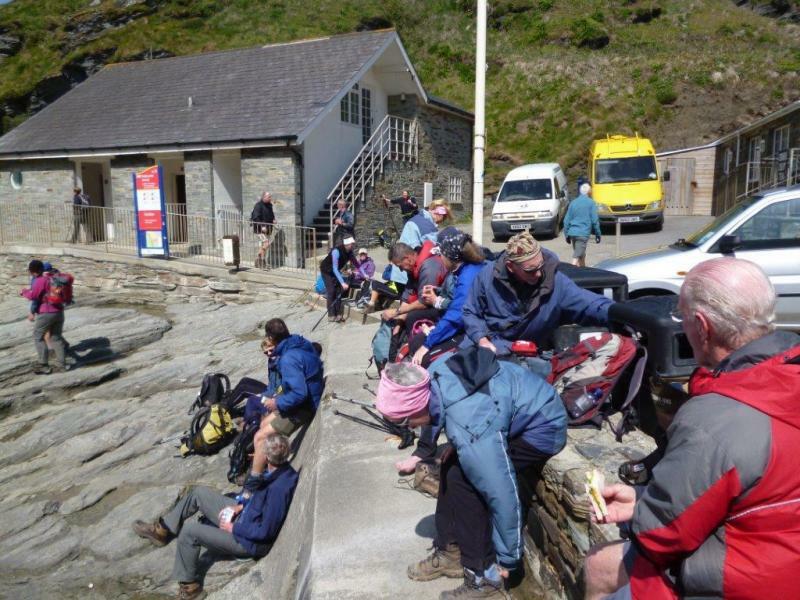 The coach awaited us at Boscastle and returned us to our hotel at Newquay. We knew it would be a long day and it was. We got back to the hotel virtually on the stroke of seven (our meal time) to only to have the Ayatollah stood there greeting us, arms folded, scowling, and the sweet words “MISTER BULLEN” on her lips. We had to go straight in to the evening meal, without even a wash, but to everyone’s credit no one complained. Barbara marched a bunch of us off to another real ale hostelry and then it was early bed! Coming down early to breakfast we were met by Mister Doom and Gloom, the Ayatollah’s partner in torture and misery, Andy the driver, informing us that an overnight storm had seen trees blown down and the road to our appointed destination closed. Norman made the decision that we should bring Thursday’s planned walk forward to today and vice versa. It proved to be another Stormin’ Norman masterstroke! Thankfully (oh thank you, thank you) we were spared the driver’s running commentary on the outward journey today. The last thing we heard however on leaving the hotel were those sweet words “MISTER BULLEN……”!!!! 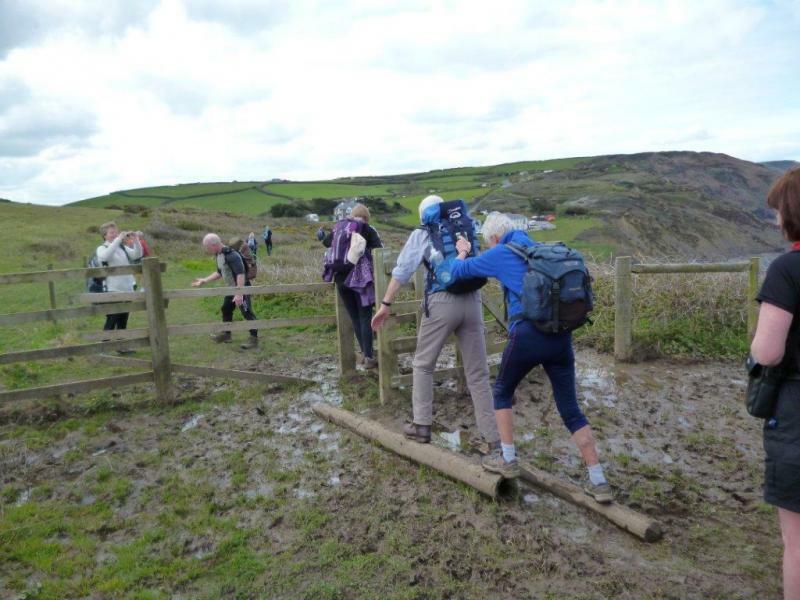 Unfortunately, storm damage the previous night made it impossible for the coach to reach Boscastle, so we had to redesign the walk. 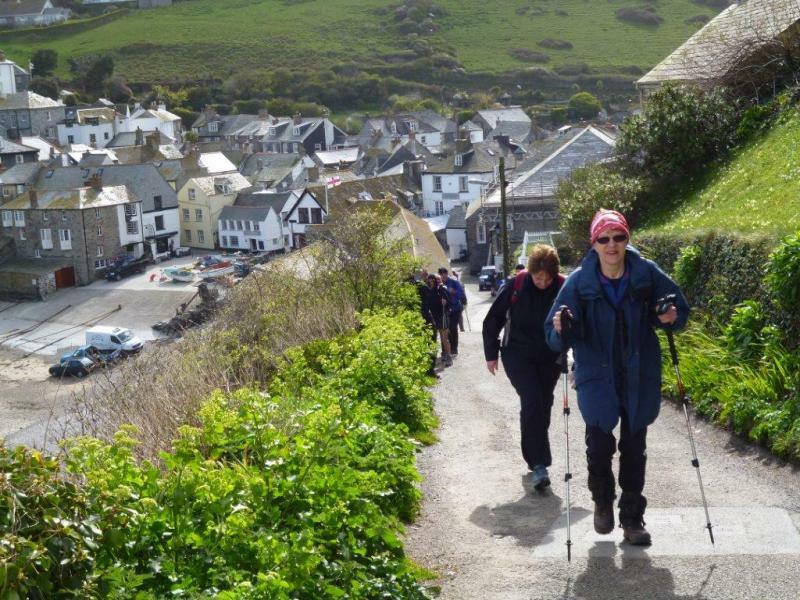 On the second day we started further down the coast at Port Isaac. A gentle ascent got us back onto the cliff top where we headed to Port Quin for morning coffee. Very tough walking followed, with many ups and downs. The scenery was spectacular along this stretch of coast, with many small bays surrounded by gigantic cliffs. A pair of seals was spotted by Geoff and Louise near to Carnweather Point. 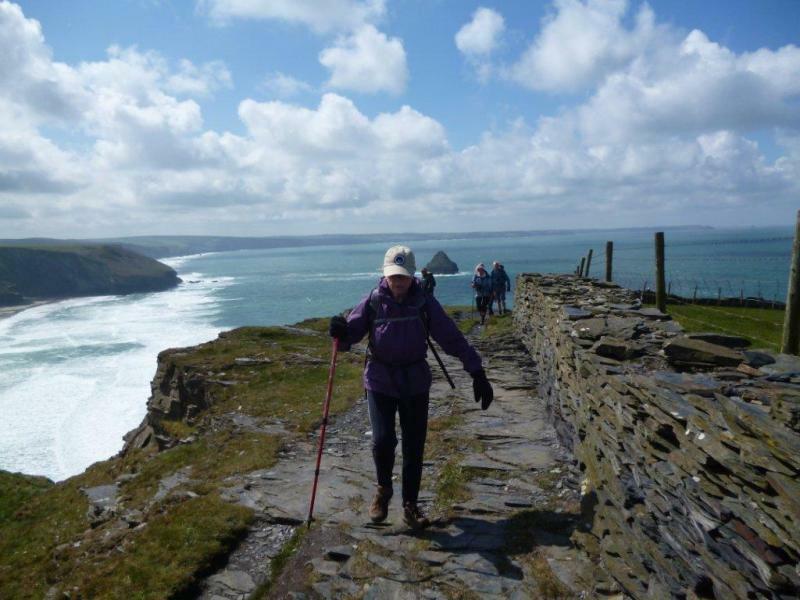 The path continued to Pentire Point, with views of Padstow in the distance. 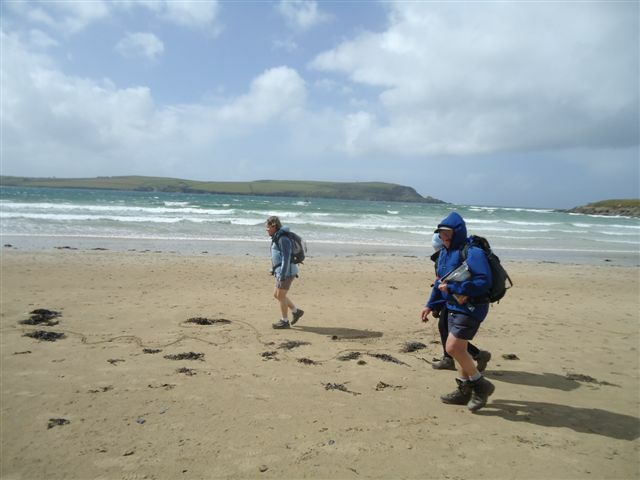 A descent into Polzeath and onto the beach for lunch was followed by a steep climb back up to Trebetherick Point and a view of the Doom Bar, at the entrance to Padstow Bay. The Doom Bar is so called because many ships have run aground here whilst attempting to enter Padstow Bay. (It is also the name of a local beer which many of us drunk back at our hotel). A ferry across the river Camel took us into Padstow. 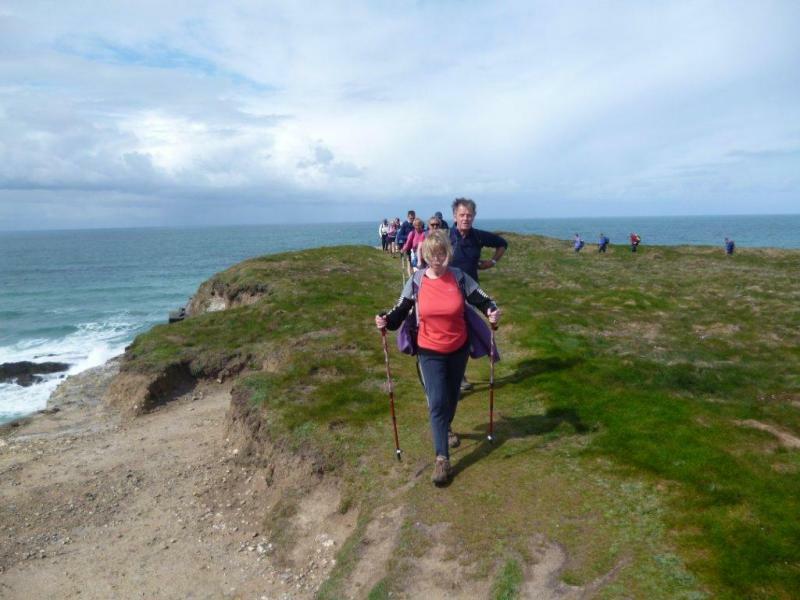 From there, the group split, some taking a shorter route to Harlyn, others the longer route around Stepper Point headland, through the village of Trevone to Harlyn. Again it was straight into the meal without time to change or wash. Barbara marched us off to another hostelry and on return it appeared the staff on the desk had lost my room key. It subsequently transpired that in rushing out in the evening I had dropped my room key in the “Letters” box rather than the “Keys” box. However given the change in attitude towards me for the rest of the week from “June” I would have done it deliberately had I known! This was one lousy day weather-wise – how fortunate that we had chosen it as our “rest day”. Mind you having joined Barbara and Viv’s tour of Newquay I wouldn’t have said I rested up! People did their own thing today – cinema, sightseeing, visit to the Eden Project or the Lost Gardens of Heligan. I am pretty sure no one in the driving wind and rain hired a deckchair for the day and sat on the beach! Sadly Geoff Parr had started with a chest infection overnight and was forced to give today a miss but the intrepid Enid came with us. Refreshed after a day’s break we were on the coach and raring to go by 8.30am. 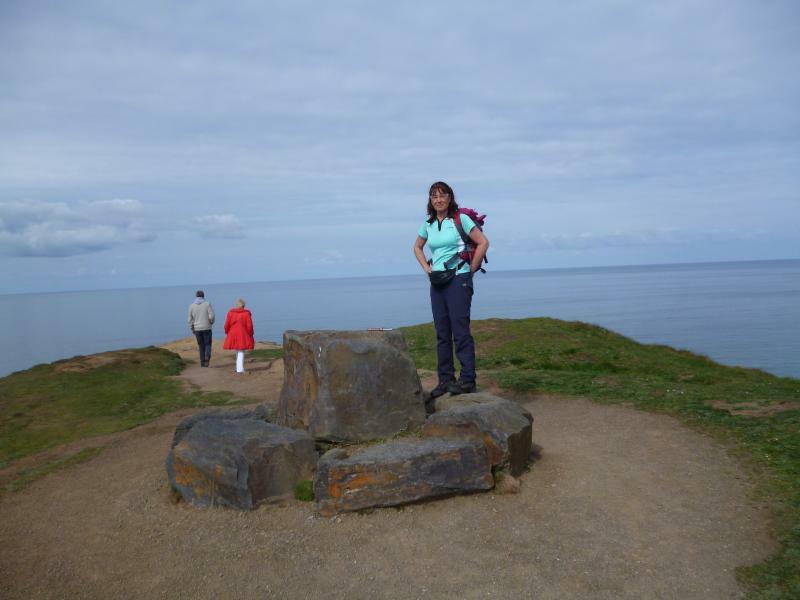 Day Four - Boscastle to Port Isaac approx 14 miles. What should really have been day two became day four’s walk, Boscastle to Port Isaac. The path took us out of the village along spectacular cliffs with many offshore stacks, one of which contained a peculiar arch known as the `Ladies Window.` Even higher cliffs at Bossiney were then scaled, before we reached the legendary Tintagel castle with it’s Arthurian connections. Lunch was taken, allowing some to take in the Visitor Centre with its excellent video presentation about Tintagel castle. A very steep zigzag path took us away from Tintagel, but allowed glorious views back to the ruins, with many photo opportunities. 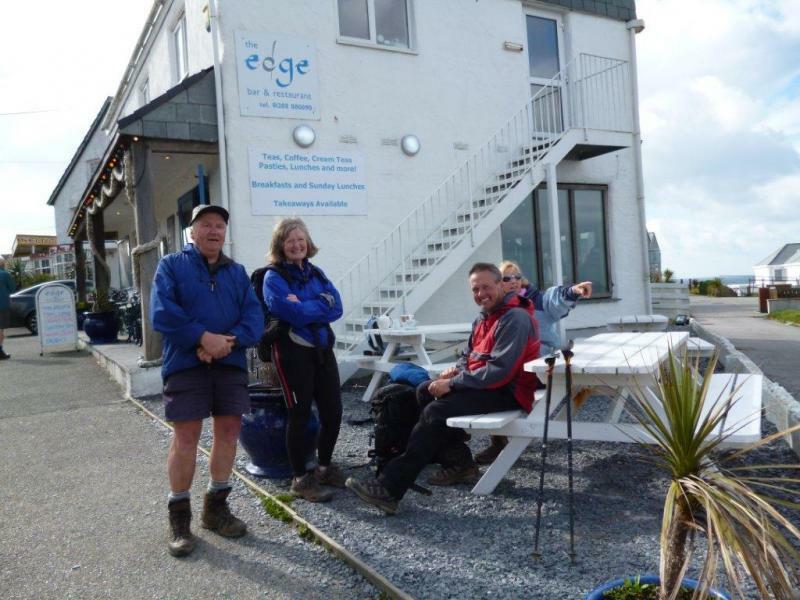 Tough walking followed, before we dropped into Trebarwith Strands for lunch on the beach. Barbara removed boots and socks for a quick dip - ankle deep only, whilst the rest of us admired the impressive Gull Rock out to sea. 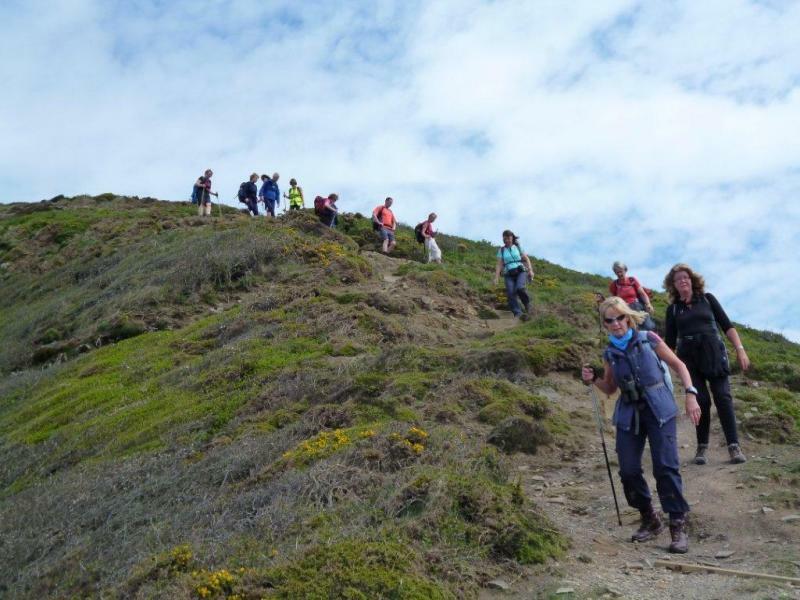 Extremely tough walking followed, with many ascents and descents into the numerous small bays before we reached the pretty fishing village of Port Gaverne, quickly followed by our destination at Port Isaac. We relaxed at the end in a lovely clifftop café which proudly displayed the autographs of all the stars of TV’s “Doc Martin” which is set in this beautiful village. I have since been informed that “The Onedin Line” was also filmed here. Norman insisted on a more military-like procession today with himself at the front and everyone keeping more or less together. 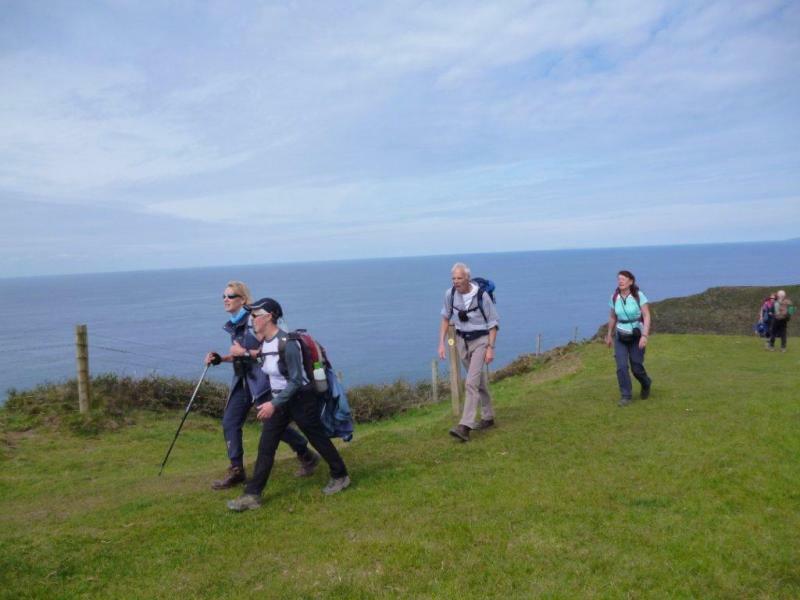 It worked, more or less, but Joan and Lynn were absolutely determined not to be seen with such a scruffy bunch of walkers! After a lovely sunny morning, the storms which we had witnessed on the horizon suddenly headed our way and we were hit by driving wind and rain, even hailstone for a short while. How ironic that after a lovely week we should finish our trek with wet gear! 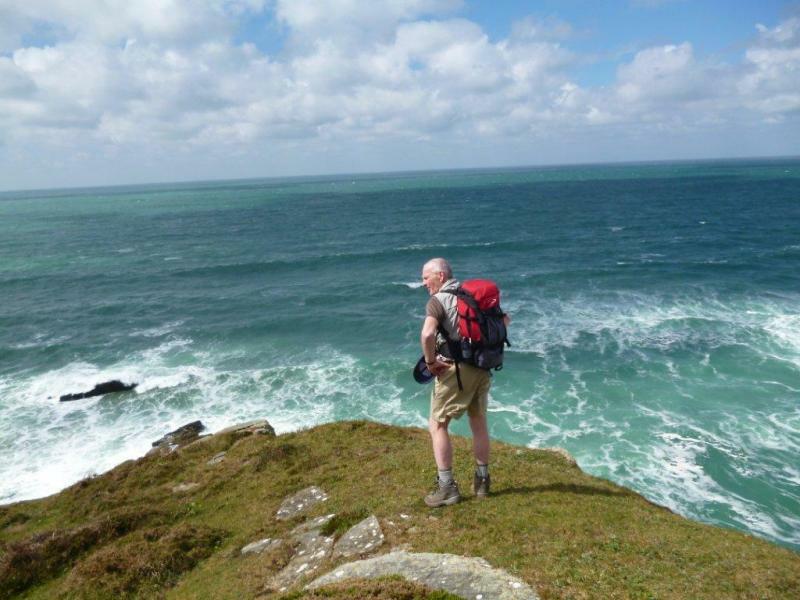 Day Five - Harlyn to Newquay approx 21 miles. Leaving Harlyn, we skirted around Mother Ivey`s Bay with it’s Lifeboat Station before reaching the lighthouse at Trevose Head. Soon we reached the picturesque YHA at Treyarnon Bay, followed by more spectacular cliffs and stacks known as `The Minnows`, before reaching the village of Porthcothan. Leaving the village, we quickly came to Bedruthan steps and the spectacular beach with its many stacks of granite. The path didn’t go down to Bedruthan beach, but continued instead along the cliff top, affording great views of the beach and stacks. Easier walking followed, before we reached the three mile long beach at Watergate Bay and the beachfront restaurant called `fifteen`, owned by Jamie Oliver. A few miles further and we reached our destination in Newquay, the Great Western Hotel, where well earned drinks, awards and congratulations were the order of the day. 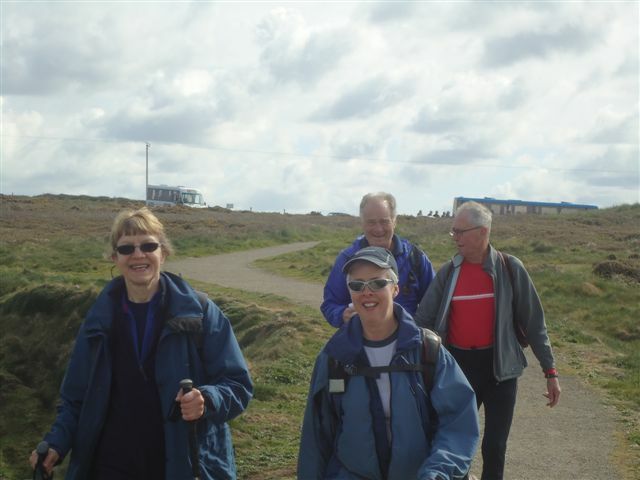 Approaching Newquay we were joined by “non walkers” David and Liz who had done a comfortable mileage of their own each day. Betty, Lynn and the sadly still- under-the-weather Geoff joined us in the Great Western, a massive pub round the corner from the hotel. 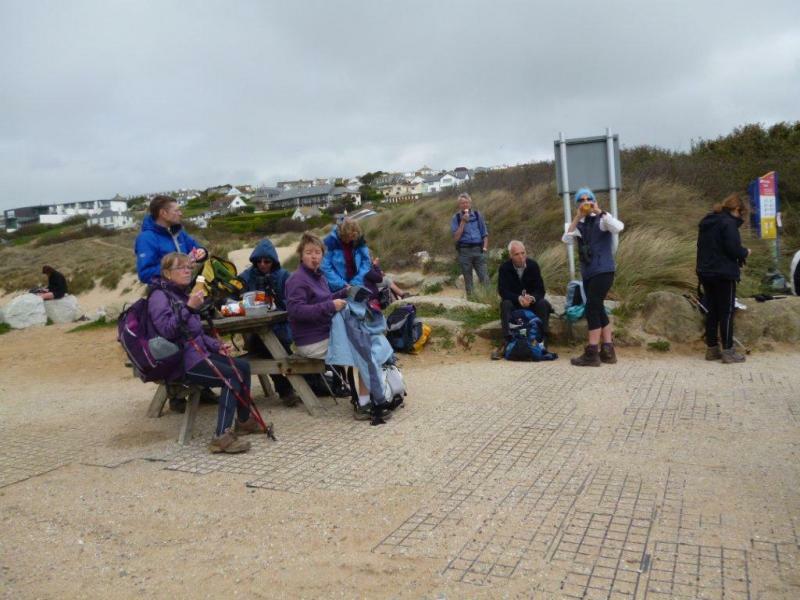 Here we had the Presentation Ceremony of badges and certificates – in David and Liz’s case the Certificate stated “you DID NOT walk 70 miles of the South West Coastal Path”!!!! The certificates were yet again courtesy of Alfa Travel and the superb cloth badge was designed by one of Norman’s young female admirers, Lucy Keating! It was backslaps, handshakes, cheers and congratulations all round with Sue Boardman, who did the entire route despite her recent injuries, getting arguably the loudest reception, closely followed by that for Lynn and Joan when they finally arrived! It was an early start to get back home with suitcases having to be outside rooms by 7.00am. Still the driver knew best and we were back at Burtonwood before four and in time for Ann Oliver to get off to her Brass Band Concert! We even had a winner to celebrate from our Lottery Tickets with Val Walmesley, a star last minute signing, picking up a tenner! Our first win from over 100 tickets! Again we fared better on the hotel bingo with Kath and Ann celebrating a “big win”! 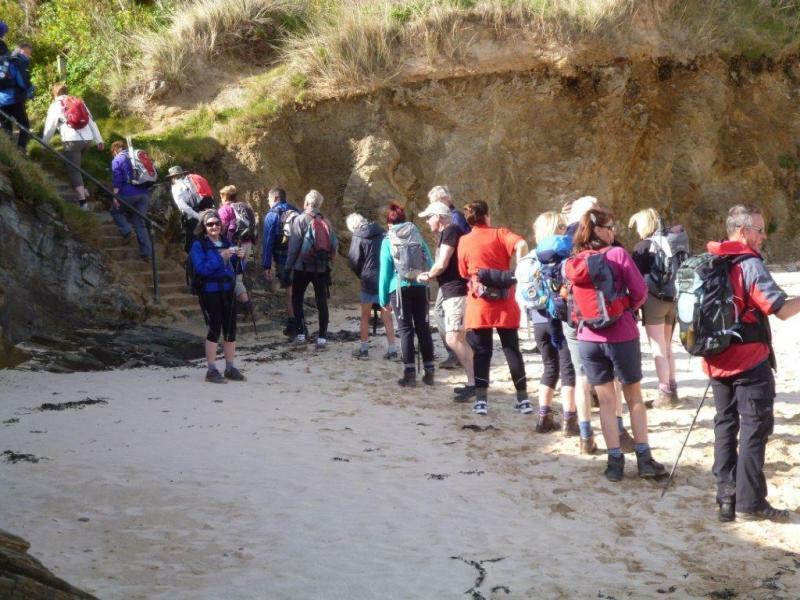 Virtually everyone has signed up for 2013’s excursion to St Ives and the next section of the stunning South West Coastal Path! Thank you to John and Howard for the pictures. Click on the link to see the walk badge designed by Lucy Keating.